Parting hair in the middle is the best choice for a girl with a heart-shaped or inverted triangle face and long tresses. It not only hides the top wide section of her face, especially the cheeks, but also makes her prominent chin look subtle enough. 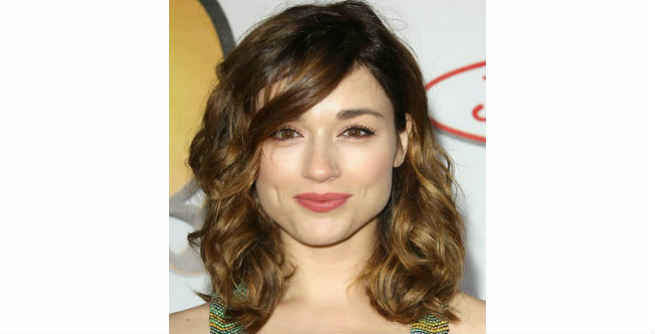 If you have short shoulder-length hair with lots of layers, the center part will simply not work for you. As your wide forehead will not be downplayed by it, your face shape will also not get complemented. So, go for a side part or a slightly off-center part that can balance out your facial features and make your face appear narrower. If you are blessed with an oval or oblong face, you have enormous scopes to experiment with the sectioning of your hair. This is the most versatile face shape that can go with almost all sorts of parts. A side or off-center part will be the most flattering choice for your oval face shape. It creates an illusion of a little wider face instead of emphasizing its length, thereby reducing its narrowness to a great extent. An oval face looks beautiful with a zigzag hair part. If you are at your late twenties and trying to add a youthful charm to your overall appearance, go for zigzag. In case, you want to give center part a try, make sure that you have long fringes along your face line. It will give you a stunning look. A square face is defined by sharp facial angles and a wide jaw line. But a side part can make those harsh angles more delicate and give your facial shape an appealing look. Your face will appear slimmer and relaxed in this way. If you want to have an intense effect, opt for a deep side part. As the bangs cross your face slantwise, the facial angles go out of sight easily creating a balance in your facial features. You can even sculpt your face with your part so that it looks remarkably oval. All you need to do is to section your hair at the middle of your head. If you have a circular face, you will definitely want to reduce the roundness and add some angles to it. A deep side part can be extremely helpful for this purpose. It will help fall a bunch of hair across your face from corner to corner, which is essential for giving the face a definition and balancing its features perfectly. Girls with round face can also go for a center part. It will put emphasis to the vertical lines and frame their faces, thereby making them look comparatively longer. So, follow these tricks in order to perfect your part according to your face shape. However, make sure that you do it only when your hair is wet slightly or moderately.